Arctic captain, St. John's wort, hydrograph. Born in a village near Arkhangelsk, he studied at a rural school. In 1901, after the father left the family, a mother with eight children moved to Arkhangelsk. Here, Dmitry, along with his elder brother, entered the city college. Life was very difficult; the funds given by my father were not enough for the maintenance of a large family. Her mother worked on washing and sewing, her elder sons helped her as much as they could. Having mastered the bookbinding, they began to bind textbooks at the beginning of the school year, during the holidays they worked at the sawmill as inspectors: they branded the boards when loading. Dmitry worked as a bricklayer at the stove-set, in 1904 he managed to find a permanent job with a solid income at the brewery. At this factory, he worked all the holidays the next four years. He wrote about his childhood years like this: “In eternal care for a piece of bread, a sad childhood passed, and so did youth. In winter, study and the desire to help the mother to feed the family, in the holidays - work and also care. There was no time to develop and frolic in their free time with their peers”. Few of the Arkhangelsk boys did not want to become a sailor. Dreamed about this and Dmitry, who decided after the end of general education school to enter the nautical school. In August 1908, before going to school, Apollo decided to test himself for suitability in the maritime profession and hired the ship Mikhail Kazi. The test went well. In the Naval School of Apollo in every navigation ship practice was held. He began with a student on the post-passenger ship, and then specialized in hydrographic vessels. In 1913, immediately after the successful graduation from college, he was called up for military service in Libau, but the medical commission found him unfit for military service and freed from military service. To obtain the diploma of a sea captain after graduating from college, it was necessary to obtain a sailing qualification, and Apollo, returning to Arkhangelsk, engaged on a sailing vessel. In 1915 he became the navigator of the expeditionary ship “Hertha”, which set out in search of the missing expedition G.L. Brusilov. From that moment began his Arctic voyages. On the “Herth” Apollo served until mid-1917, then for two years on the hydrographic vessel “Murman” he was taking measurements of the White Sea and the topographical survey of its coast. Having become a captain of the Pakhtusov hydrographic vessel in 1919, he worked off the coast of Novaya Zemlya and in the Kara Sea, reached Dixon, and in 1921 he was assigned to inspect the Chernaya Bay in the south of Novaya Zemlya. In 1922, Apollon joined the Sevkoryb association as a captain of the Kollevik motor sailing bot, where he supplied fishing sites scattered along the coast of the White Sea. 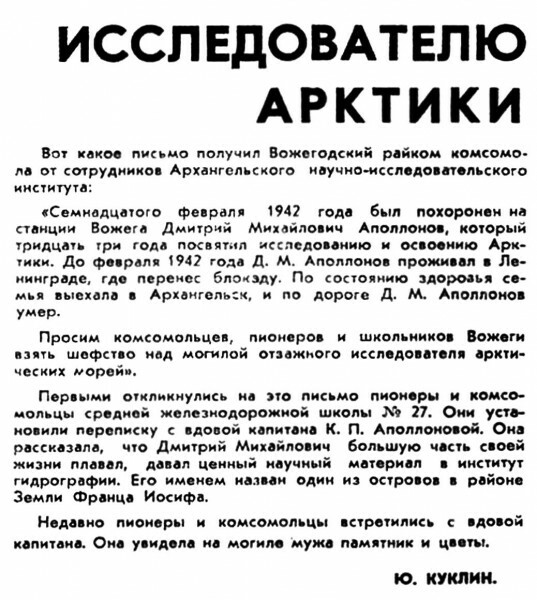 In 1924, Apollo moved to the Sevkoryba office, but could not withstand the settled coastal service for more than four years. Having settled in the “Tralflot”, he worked as an assistant captain and captain, first in fishing minesweepers, and then on the hunting vessels. 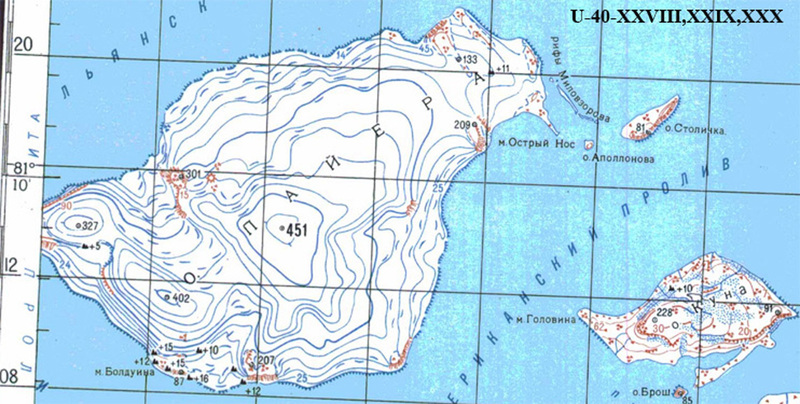 In 1933, a hydrographic survey in the straits of Franz Josef Land was carried out on the Smolny Apollo tanker: several islands were mapped, underwater hazards were discovered, and the position of coastlines was clarified. In 1937, Apollo commanded the Nerpa, a hunting vessel, on board of which an expedition from the Arctic Institute patrolled the ice edge in the Greenland Sea, made 43 deep-water hydrological stations, visited the North of the Kara Sea and the Straits of Franz Joseph Land. The following year, the Nerpa again conducted patrols, and also made several cuts between Novaya Zemlya and Spitsbergen. The last Arctic voyage Apollo made in 1940 on the expedition vessel "Akademik Shokalsky". The expedition of the Arctic Institute studied the hydrological regime of the Laptev Sea. Unfortunately, there is practically no information about the last years of Apollon’s life. It is only known that he died in Leningrad during the blockade. Place of burial unknown. An island in the north of the American Straits in the archipelago of Franz-Josef Land. Opened and shown on the map without a name by the expedition A. Fiala in 1903-1905. Named in 1933 by the «Smolny» crew of the vessel. 1] Based on the material of B. Maslennikov's article in the Pravda Severa newspaper on 31.05.1990 year.